Noted for his scenes of peasant farmers, Jean Francois Millet was a founder of the Barbizon School of France, a Romantic movement in art, and was a Naturalistic, Realist painter. He learned Latin and knowledge of the major works of literature from village priests as a child, and in 1833 moved to Cherbourg to study painting. 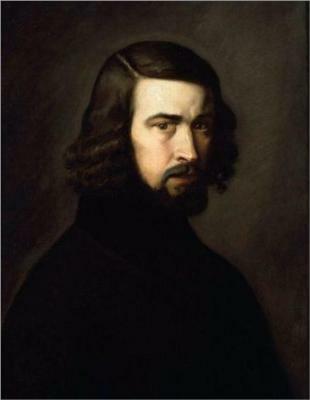 His first Salon submission, in 1839, but his second, a portrait, was accepted in 1840. After his first portrait was accepted by the Paris Salon, he returned to Cherbourg, to begin his career as a professional portrait painter. His first real Salon success was seven years later, in 1847, when he presented his panting The Winnower, which was bought by the government a year later. His success was short lived, however. The Captivity of the Jews in Israel was presented to the Salon in 1848, and it was scorned by the public and critics. This painting quickly disappeared, leading historians to think Millet had destroyed his own work. Occasional failure notwithstanding, Millet’s popularity grew throughout the 1860’s, and he received many commissions, hosting a major showing of his work in 1867 in the Exposition Universeille. The next year, he was named an officer of the National Legion of Honor, and in 1870 he was elected as a jury member at the Paris Salon. 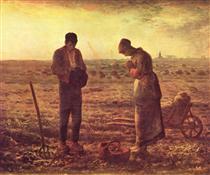 In 1875, three weeks before his death, Millet married his wife in a religious ceremony. They had been married in a civil ceremony in 1853. After he died, he left his wife and nine children destitute, spurring the invention of the droit de suite innovation, which allowed a certain portion of the sale or resale of an artist’s work to go to the artist’s family of heirs. Millet left a legacy that would influence Vincent van Gogh, Claude Monet, and Georges Seurat. His life and works also inspired plays, poems, and further artistic endeavors by artists such as Mark Twain and Salvador Dali. Jean-François Millet (French: [milɛ]; October 4, 1814 – January 20, 1875) was a French painter and one of the founders of the Barbizon school in rural France. Millet is noted for his scenes of peasant farmers; he can be categorized as part of the Realism art movement. Millet was the first child of Jean-Louis-Nicolas and Aimée-Henriette-Adélaïde Henry Millet, members of the farming community in the village of Gruchy, in Gréville-Hague (Normandy), close to the coast. Under the guidance of two village priests - one of them was vicar Jean Lebrisseux - Millet acquired a knowledge of Latin and modern authors. But soon he had to help his father with the farm-work; because Millet was the eldest of the sons. So all the farmer's work was familiar to him: to mow, make hay, bind the sheaves, thresh, winnow, spread manure, plow, sow, etc. All these motifs would return in his later art. This stopped when he was 18 and sent by his father to Cherbourg in 1833, to study with a portrait painter named Paul Dumouchel. By 1835 he was studying full-time with Lucien-Théophile Langlois, a pupil of Baron Gros, in Cherbourg. A stipend provided by Langlois and others enabled Millet to move to Paris in 1837, where he studied at the École des Beaux-Arts with Paul Delaroche. In 1839 his scholarship was terminated, and his first submission to the Salon was rejected. After his first painting, a portrait, was accepted at the Salon of 1840, Millet returned to Cherbourg to begin a career as a portrait painter. However, the following year he married Pauline-Virginie Ono, and they moved to Paris. 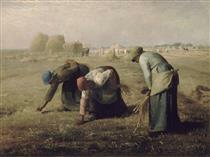 After rejections at the Salon of 1843 and Pauline's death by consumption, Millet returned again to Cherbourg. 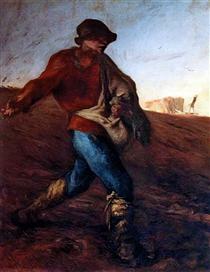 In 1845 Millet moved to Le Havre with Catherine Lemaire, whom he would marry in a civil ceremony in 1853; they would have nine children and remain together for the rest of Millet's life. In Le Havre he painted portraits and small genre pieces for several months, before moving back to Paris. 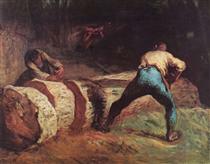 It was in Paris in the middle 1840s that Millet befriended Constant Troyon, Narcisse Diaz, Charles Jacque, and Théodore Rousseau, artists who, like Millet, would become associated with the Barbizon school; Honoré Daumier, whose figure draftsmanship would influence Millet's subsequent rendering of peasant subjects; and Alfred Sensier, a government bureaucrat who would become a lifelong supporter and eventually the artist's biographer. In 1847 his first Salon success came with the exhibition of a painting Oedipus Taken down from the Tree, and in 1848 his Winnower was bought by the government. The Captivity of the Jews in Babylon, Millet's most ambitious work at the time, was unveiled at the Salon of 1848, but was scorned by art critics and the public alike. 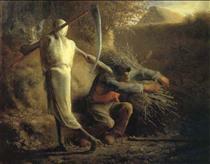 The painting eventually disappeared shortly thereafter, leading historians to believe that Millet destroyed it. In 1984, scientists at the Museum of Fine Arts in Boston x-rayed Millet's 1870 painting The Young Shepherdess looking for minor changes, and discovered that it was painted over Captivity. 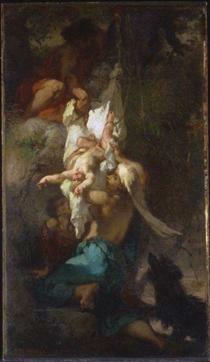 It is now believed that Millet reused the canvas when materials were in short supply during the Franco-Prussian War.